The dollars and cents that go into moving vary greatly depending on a number of factors. Making the decision to move can be an exciting time, whether you’re moving across town or across the country. But it can also be a milestone surrounded by uncertainty: am I making the right decision? How will my kids adjust to a new school? Will I like my new neighborhood? According to the US Census, 11.2 percent of Americans moved in 2016, for reasons related to housing, family, and employment. And there’s one question pretty much everyone who is thinking about moving asks: How much will it cost to relocate? There are all kinds of moving expenses to keep in mind, including changes in cost of living, balancing two mortgages (or a mortgage and rent) during the transition, and the cost of actually getting all your belongings from point A to point B. Here’s some information about average moving expenses to help you make sense of it all. Roughly half of all people who move use professional movers, whether they’re moving short or long distances. These are average costs for moving, according to HomeAdvisor. Of course, prices vary by region and by distance. How much does it cost to move across town? Local moves make up the vast majority of people moving every year. According to Zillow research, 57 percent of home buyers who also sell a home move within the same city, and 86 percent move within the same state. For local moves, you’ll typically pay an hourly rate that includes a truck and the services of two movers. The bigger your home, the longer your move will take. Consider these estimates from HomeAdvisor. How far in advance should I book local movers? Keep in mind that most people move between May and September, so you’ll want to book your movers at least four weeks ahead of time. The earlier you book, the more likely you are to get the day and time that works best for you, and the more likely you are to get an experienced crew. The least expensive days to move are Monday-Thursday. In the off-season (October-April), you can often book movers with only one to two weeks’ notice. While local movers typically charge by the hour, for a cross-country move you’ll likely be charged based on two key variables: weight and distance. Before the move, the empty truck is weighed, and your mover should provide you with an “empty weight” receipt. Then, once all your belongings are loaded, they’ll weigh your truck again to help them determine your moving cost. Have no idea how much your belongings weigh? Reputable movers will give you an estimate before you sign on the dotted line, using average weights for homes of your size (more on estimates later). For example, the goods inside a 1,000-square-foot, 3-bedroom apartment typically weigh about 5,000 pounds. A 2,800-square-foot, 4-bedroom home’s furnishings typically weigh in at around 20,500 pounds. Simply put, the farther a moving company has to transport your belongings, the higher the bill will be. You’ll likely be charged a per-mile rate in addition to the weight-based charges. Make sure to ask if there are any additional transportation charges, like fuel or tolls. How far in advance should I book movers for a long-distance move? For an interstate or cross-country move, you’ll want to book your movers as early as possible — ideally six to eight weeks before your move. Moving costs vary depending on factors such as the number of belongings, the length of the move, and the services provided. Just a truck rental: The ultimate DIY move, in this scenario you’ll be doing the packing, loading, transportation, unloading, and unpacking on your own, with just the help of a rental truck. Flat per-day rates start at around $20 per day, depending on the size of the truck, plus charges for gas and mileage. Loading, transportation, and unloading: Save your back by doing all the packing and unpacking yourself, but have professional movers do the heavy lifting. For a local move, this service can range from $200 for a one-bedroom apartment to $2,000+ for a 4-bedroom house. Full-service moves: Leave everything to the pros, including wrapping and packing your belongings, loading them, transporting them to your new home, and unloading. You’ll just be responsible for unpacking your belongings and getting settled. This type of move is usually used for long-distance moves. Expect to pay roughly $2,000-$5,000 for the transportation, plus about 50 cents per pound, plus $25-$50 per hour, per mover for packing and unpacking help. Temporary storage: If your moving dates don’t line up exactly, you may find yourself needing to temporarily stash your things in a storage unit or moving container. Storage facility rates start at about $50 per month for a small unit, and go up to $300 or $400 for larger units. If you’d like the convenience of a portable storage unit that’s delivered to your home, loaded by you, and stored in a warehouse until you’re ready for re-delivery, expect to pay $150-$300 per month, plus delivery and re-delivery costs. 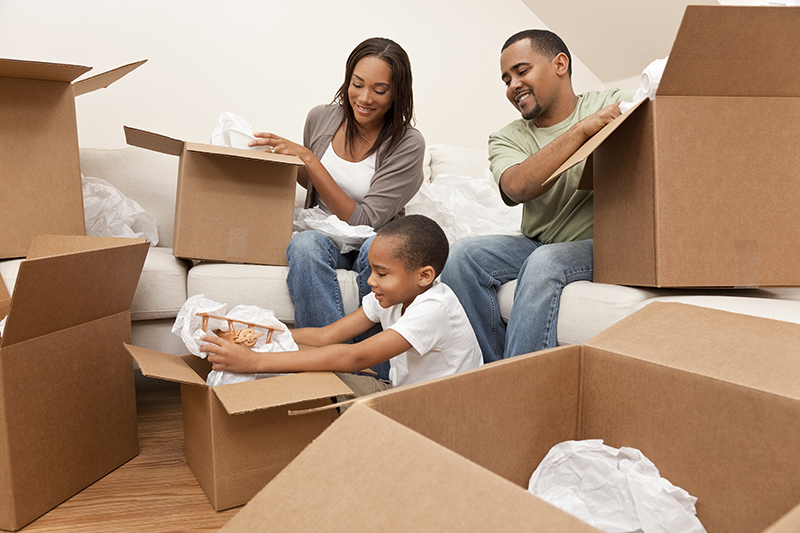 Moving supplies: Instead of buying and then recycling boxes, you can go green and rent hard plastic boxes for your move. Prices start at about $50 per week for enough boxes to pack a 1-bedroom apartment, and up to $200 to pack a large house. Once you’re done, the rental service will pick up the boxes. To save money on cardboard boxes, check your local “buy nothing” group or moving truck rental company, which often have used boxes on hand. You may opt to purchase full value protection insurance. Released value protection is typically included by movers at no cost, but the protection is minimal — just 60 cents per pound per article lost or damaged. Charges for moving vehicles, including cars, boats, and motorcycles. Surcharges for moving large or fragile items — think swing sets, pianos, extra-large furniture, or riding lawn mowers. Additional charges if the movers have to walk more than 75 feet from door to truck, or if they need to use stairs or an elevator. Additional charges if your street is too narrow to accommodate a moving truck and they’ll need to shuttle your belongings with a smaller truck. You may find yourself paying unexpected moving costs if there’s a delay in the availability of your new home and the moving company has to put your items into storage. Non-binding estimates are the industry standard. They reflect the company’s best guess as to what your final bill will be, but they can often be inaccurate. Whenever possible, opt for not-to-exceed quote. Not-to-exceed estimates are quotes where the moving company commits to a maximum price. To avoid being surprised by high moving costs, ask your movers to provide a not-to-exceed estimate. When it comes to moving, the best way to limit your costs (and to keep your sanity) is to move quickly. The faster you’re out of your old home and into your new home, the less you’ll pay in movers, rented supplies, storage costs, and — most importantly — overlapping mortgage payments or rent. Looking to sell your house in a hurry? Check out Zillow Instant Offers, where you can list your home for investors only and attract offers from investors who are ready to buy. Originally published July 2012; data updated March 2018. Mary was a newspaper writer/editor for 13 years and worked as spokesperson for a Fortune 500 Company before becoming a freelance writer. She has authored more than two dozen books for young readers and writes for a handful of regional home and garden magazines. This entry was posted in Blog on April 6, 2018 by James Silver.